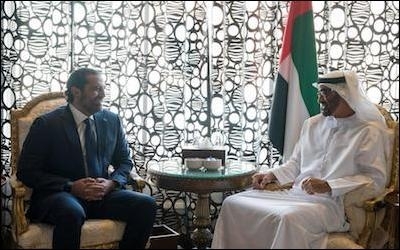 Former Lebanese Prime Minister Saad Hariri (left) meeting with Sheikh Mohammed bin Zayed al-Nahyan, the crown prince of Abu Dhabi, on November 7 in the UAE. Saad Hariri resigned his post as Lebanon's prime minister, citing an assassination plot brewing against him, presumably from his former government coalition partner Hezbollah. "Wherever Iran settles," he said in a televised speech, "it sows discord, devastation and destruction, proven by its interference in the internal affairs of Arab countries." Iran's hands in the Middle East, he then said, "will be cut off." He delivered that speech and resignation not from Beirut but from Saudi Arabia. In a sinister statement worthy of Syrian tyrant Bashar al-Assad himself, Lebanese President Michel Aoun, a long-time tool of Damascus, says he won't accept Hariri's resignation unless he returns to Beirut and hands it over in person. Nobody really knows what's going on there right now. Lebanon is one of the hardest countries in the world to make sense of sometimes, even for experts, because there are easily ten different versions of every event, nearly everyone lies, and your average Lebanese media organ is a tribal sectarian fusion of Breitbart, Alex Jones and Pravda. For instance, Hezbollah Secretary General Hassan Nasrallah says the Saudis forced Hariri to step down, and the hysterical pro-Hezbollah news rag al-Akhbar goes even further and says Hariri is under house arrest in Riyadh, a story proven instantly false by the fact that Hariri is now in Abu Dhabi. The Lebanese Army says it isn't aware of any assassination plots inside the country. Hardly a credible statement. Hezbollah effectively controls Lebanon's army now, and in 2011, an independent United Nations tribunal fingered Hezbollah for the assassination of Hariri's father on February 14, 2005, with a gigantic bomb in the city center. Not even a damn fool would expect the army to say, yes, our masters are planning to retire yet another prime minister. MP Samir Geagea says Hariri stepped down "because the government was not able to practice its authority as was expected of it...The developments of the past eight months left no room for someone to continue on respecting themselves." Hariri in the Lebanese prime minister's office was a band-aid on a sucking chest wound. That is a credible statement, though Hariri should have known from the very beginning that he'd end up compromising himself, perhaps fatally, by agreeing to form a government with an Iranian-backed terrorist organization. He had no choice if he wanted the job, and reasonable people can understand how he might convince himself that he'd be a moderating force, but there was never a chance that that would pan out. Hariri in the prime minister's office was a band-aid on a sucking chest wound, but he's a good guy with nothing remotely in common with the grim Iranian ayatollahs, the sour-faced kings in the gulf or the military dictators who erect billboards of themselves overseeing their subjects from behind reflective sunglasses. I met him once when he invited me and some other journalists to his home in Beirut for dinner. (This was back before he became the prime minister the first time in 2009.) From the outside, his place looks like a medium-rise apartment tower on a dense urban street, but the entire building is his. We took an elevator up to the dining room, an opulent gilded cage. When he wanted to go out for dinner, he had to do it in France. When he greeted me, he shook my hand and said, "hey, man, what's up?" He drinks whiskey and plays Xbox. (At least he used to.) He wants peace with Israel even though he's shy about saying so for reasons that I trust are obvious. He's not even interested in absolute power for himself, though truthfully Lebanon would be in better shape if someone like him did have absolute power. Lebanon, however, is the kind of place where no one can wield absolute power, not even Hezbollah, and not even Assad back when his army occupied most of the country. Lebanon has dozens of political parties, almost twenty different religious sects crammed together cheek by jowl in a space only half the size of miniscule Israel, pretty much every family is armed to the teeth, and few are shy about pulling the trigger to protect their communities. Hardly any other place in the world would be harder to transform into a hierarchical collective with a pyramid-shaped org chart and a dictator on top. My conversation with Hariri was entirely off the record, so I can't quote anything he said, but I will say this: the man is emphatically not part of the problem in the Middle East. And by "the problem," you can fill in the blanks with whatever you want—terrorism, war, autocracy, religious bigotry, mass slaughter and all the rest of it. Hariri, like his father before him, is one of the precious few genuinely liberal political leaders the Middle East has ever produced. Iran's conquest and de-facto annexation of Lebanon is complete. And now he's out. Again. The only thing surprising about the fact that he's no longer Lebanon's prime minister is that he was ever Lebanon's prime minister in the first place. He was basically just a figurehead, though, the friendly smiling face of a regime that is mortally compromised by Hezbollah, the amputated remnants of Syria's Assad regime, and the Islamic Republic regime in Iran. 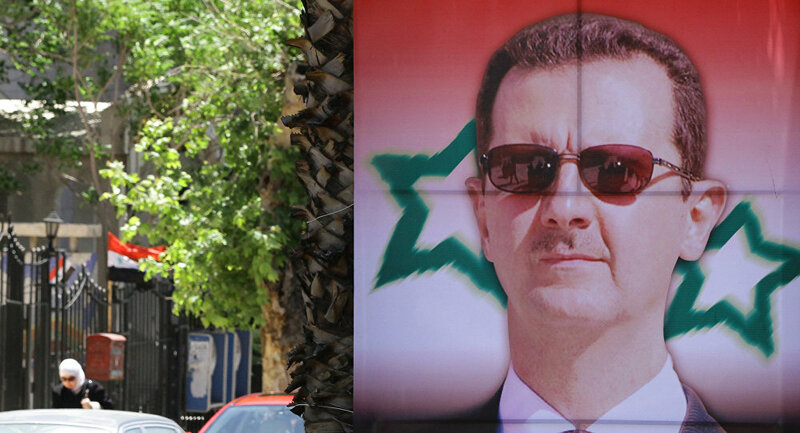 He's better off not surrendering his own moral and political legitimacy by refusing to collaborate with terrorists and mass murderers, and he's doing the rest of us a favor, honestly, by exposing Lebanon's government for what it truly is—the subject of a hostile takeover by malevolent foreign powers in Damascus and Tehran. Is there really an assassination plot against Hariri? Is he just being paranoid? Or is that just a cover story while he's actually resigning for another reason entirely? I have no idea. All three of those explanations are perfectly plausible. What I do know is that Iran's conquest and de-facto annexation is complete. And now that Hariri is out, Beirut isn't wearing a mask anymore.